Discover an inviting world of birds, flowers, and creatures beautifully drawn in idyllic settings that will delight and inspire the numerous fans of adult coloring books. 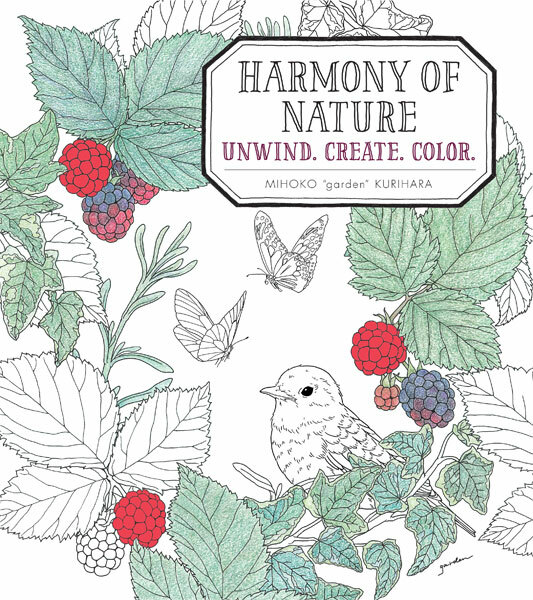 Originally published in Japan and created by illustrator and paper cutting artist Mihoko "garden" Kurihara, Harmony of Nature presents charming, pastoral vignettes for coloring that are both whimsical and serene. Intricate drawings show squirrels and birds, field mice and rabbits, deer, butterflies, foxes and more surrounded by halcyon havens of lush florals. Those drawn to the meditative aspects of adult coloring books will find a sense of calm permeating each page. The book also includes 8 pages of full-color, aspirational photos of styled and colored drawings along with two one-sided pages that can be cut out and used for framing or gift tags.